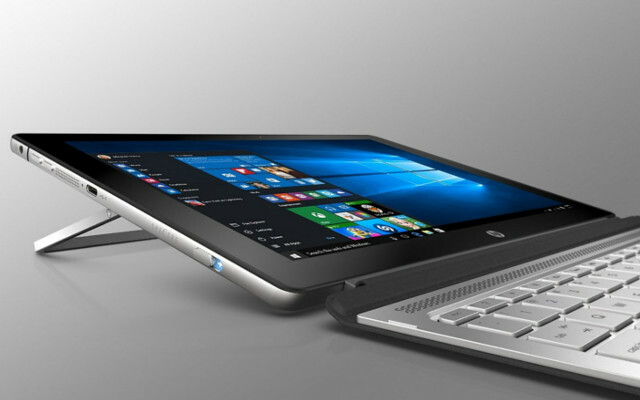 HP is dead set on making a name for itself in the convertible space. Recently we chatted up about the HP Spectre X2 12-a008nr and today we're gonna take a look at a more modest and "down to earth" model within the same lineup. Specifically we're going to review the HP Spectre 12-a001dx, a nice- and affordable - 12 inch convertible with a quality build, 128 GB of Solid state drive storage and a Skylake generation Core M processor, amongst other virtues. Let's get on with it! Pros: Skylake generation Core M CPU, 128 GB of SSD storage, 12 inch WXGA display, quality construction, 10 hour battery life. Cons: 4 GB of RAM (non upgradable), no standard USB 3.0 ports. Perhaps the most attractive feature of the Spectre 12-a001dx is its design. This sophisticated convertible comes in with a 12 inch WLED touchscreen display with a 1920 by 1280 pixel resolution. If we assume that most of its competitors still carry around a standard HD display this is great news for people looking to buy a high resolution convertible. The tablet on its own weighs just shy of 2 pounds while the whole combo weighs a little over 2.6 pounds. Couple that with an ample 10 hour battery life and you can see how "portability" is the key factor for this convertible. Something that really surprised us was the inclusion of a backlit keyboard, something that's not all that common amongst convertibles and gives this particular model even more use scenarios. Enough with the chit chat about design, a laptop is only the sum of its components and in that regard the HP Spectre 12-a001dx is doing pretty well thanks to a sixth generation Intel Core M3 6Y30 CPU. While it's true that Core M processors aren't getting the best rep, they're actually pretty good for average usage. This particular model has two cores, 4 MB of Intel's smart cache and works at a base frequency of 0.9 GHz, upgradable to 2.2 GHz when we're looking to do more intensive work. This processor is an excellent option for stuff such as web surfing, document editing, image editing, watching movies and so forth. It's ready and able to handle just about any task you throw its way and could be compared in terms of performance to a third or even fourth generation Core i5 CPU. System memory is a bit low for my taste, we've got 4 GB of DDR3 RAM and I hate to be the bearer of bad news but it's not user upgradable. 4 GB of RAM is great is you're not a very demanding user. If you're just gonna run three-four programs at a time and have a bunch of tabs open on your browser then you shouldn't run into any trouble but if you're going to do stuff like coding and compiling over an IDE or launching virtual machines you might find yourself in an awkward situation with only 4 GB of RAM. What are my gaming options? Intel HD 515 Graphics is the GPU in charge of gaming and to very little surprise it's an integrated graphics which offers very little for gamers. Overall you might be able to play some 2014 titles like Fifa 14 but more demanding stuff should be left for devices with a dedicated graphics chip that can deliver in that aspect. Once we've taken that out of the way and stated in our review of the HP Spectre 12-a001dx that this isn't a gaming machine we should point out two of its strongest selling points: the storage and battery life. Specifically, we love the 128GB of SSD storage because while it may not be enough for all users it gives us the benefit of having a laptop that doesn't need to compromise all that much when giving us storage velocity. Also, if you're eager for more storage we would recommend taking a portable hard drive with you since it's more likely that the hard drive will outlast the laptop (be it this one or any other one). Battery life is the other big advantage of the Spectre 12-a001dx which comes with a 3 cell battery capable of delivering up to 10 hours of battery life. Even if the Spectre laptop doesn't meet the full 10 hour benchmark for real usage we believe that a solid 8 hours should be expected and therefore we're still pretty happy we don't have to carry around the power cord with us. The great thing about the Spectre 12-a001dx being a tablet as well as a laptop is that you get both a front facing camera and a rear facing camera. To that point we've got a 5 megapixel front facing shooter and an 8 mpx rear facing shooter. Obviously we don't recommend openly taking pictures with a 12 inch tablet but it's good to have it there in case you need to make use of it. Aside from the cameras we've also got a couple of USB Type C ports which support sleep charge, an SD card reader, mini HDMI output and an audio jack. There's also the obvious Bluetooth support as well as WiFi ac connectivity to deliver fast download speeds when you have a compatible WiFi ac router. Finally, it should also be pointed out that this laptop also features an LTE option that can only be activated when purchasing a Verizon data plan, something that definitely adds to the pros pile for this particular model. On a final note we should also mention that the audio quality on this machine is pretty good thanks to the Bang & Olufsen speakers which deliver a pretty impressive sound considering the size and dimensions of the device. What's the call? Should I buy this laptop? This isn't as easy a decision as one might think. After reviewing the HP Spectre 12-a001dx, we love the display, the portable design, the quality build, the ample storage and the extensive battery life. Processor is pretty great too if you're not looking to do some seriously intensive work but we would've really liked to see a bit more RAM. Having 4 gigs of RAM means this laptop is mostly geared at students and workers on the go, not a bad market but 8 gigs of RAM would've definitely made things easier to recommend this convertible to anyone. That said, unless you're looking to do some seriously heavy multitasking then this convertible is likely to meet your needs and then some. You can look it up for pricing and availability here.